The Chuuk (or Truk) Lagoon is a large atoll north of New Guinea. Back in February of 1944, the U.S. Navy launched an attack on the Imperial Japanese Army called Operation Hailstone. It was one of the most spectacular battles of the Pacific theater. By the end of it, thousands of soldiers on both sides were dead. 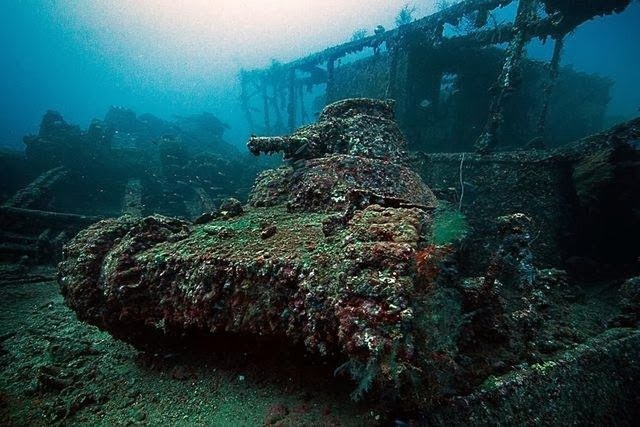 Weapons, machinery and the corpses of the soldiers are forever entombed at the bottom of the Pacific. And they are still there, left untouched, just as they were nearly 70 years ago.